The Baltimore Sun is the largest general-circulation daily newspaper based in the American state of Maryland and provides coverage of local and regional news, events, issues, people, and industries. Founded in 1837, it is owned by tronc, Inc. (formerly known as Tribune Publishing). The Sun was founded on May 17, 1837, by printer/publisher Arunah Shepherdson Abell (1806–1888) and two associates, William Swain (1809–1868) and Azariah H. Simmons, recently from Philadelphia, where they had started and published the Philadelphia Public Ledger. Abell was born in Rhode Island, and began with the Providence Patriot and later with papers in New York City and Boston. The Abell family owned The Sun (later colloquially known in Baltimore as The Sunpapers), until 1910, when the local Black and Garrett families of financial means gained a controlling interest while still retaining the name A. S. Abell Company for the parent company. The paper was sold in 1986 to the Times-Mirror Company of the Los Angeles Times. The same week, the rival The News American, with publishing antecedents going back to 1773, the oldest paper in the city, now since the 1920s owned by the Hearst Corporation, announced it would fold. In 1997, The Sun acquired the Patuxent Publishing Company, a local suburban newspaper publisher that had a stable of weekly papers. 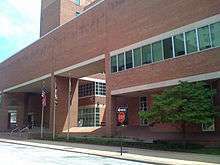 The Sun, like most legacy newspapers in the United States, has suffered a number of setbacks of late, including a decline in readership, a shrinking newsroom, and competition from a new free daily, The Baltimore Examiner, which has ceased publication. In 2000, the Times-Mirror company was purchased by the Tribune Company of Chicago, whose newspapers, including The Sun, were transferred to Tribune Publishing in 2014. From 1947 to 1986, The Sun was the owner of Maryland's first television station, WMAR-TV. 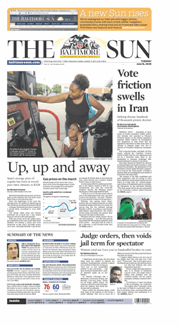 On September 19, 2005, and again on August 24, 2008, The Baltimore Sun introduced new layout designs. Its circulation as of 2010 was 195,561 for the daily edition and 343,552 on Sundays. On April 29, 2009, the Tribune Company announced that it would lay off 61 of the 205 staff members in the Sun newsroom. On September 23, 2011, it was reported that the Baltimore Sun would be moving its web edition behind a paywall starting October 10, 2011. On February 20, 2014, The Baltimore Sun Media Group announced they are going to buy the alternative weekly City Paper. In April, the Sun acquired the Maryland publications of Landmark Media Enterprises. The Baltimore Sun has been home to some of the best American writers, including reporter, essayist, and language scholar H.L. Mencken, who enjoyed a forty-plus year association with the paper. Other notable journalists, editors and cartoonists on the staff of Sun papers include Rafael Alvarez, Richard Ben Cramer, Russell Baker, A. Aubrey Bodine, John Carroll, James Grant, Turner Catledge, Edmund Duffy, Thomas Edsall, John Filo, Jon Franklin, Jack Germond, Mauritz A. Hallgren, David Hobby, Brit Hume, Gwen Ifill, Gerald W. Johnson, Kevin P. Kallaugher (KAL), Murray Kempton, Frank Kent, Tim Kurkjian, Laura Lippman, William Manchester, sportscaster Jim McKay, Kay Mills, Reg Murphy, Thomas O'Neill, Drew Pearson, Ken Rosenthal, Louis Rukeyser, Dan Shaughnessy, David Simon, Michael Sragow, John Steadman, and Jules Witcover. The paper has won 15 Pulitzer Prizes. The Baltimore Sun is featured in season 5 of The Wire, which was created by former Sun reporter David Simon. Like all of the institutions featured in The Wire, The Sun is portrayed as having many deeply dysfunctional qualities while also having very dedicated people on its staff. The season focuses on the role of the media in affecting political decisions in City Hall and the priorities of the Baltimore Police Department. Additionally, the show explores the business pressures of modern media through layoffs and buyouts occurring at the Sun, on the orders of the Tribune Company, the corporate owner of The Sun. One storyline involves a troubled Sun reporter named Scott Templeton with an escalating tendency of sensationalizing and falsifying stories. The Wire portrays the managing editors of The Sun as turning a blind eye to the protests of a concerned line editor in the search for a Pulitzer Prize. The show insinuates that the motivation for this institutional dysfunction is the business pressures of modern media, and working for a flagship newspaper in a major media market like The New York Times or The Washington Post is seen as the only way to avoid the cutbacks occurring at The Sun. Season 5 was The Wire's last. The last episode, "-30-", features a montage at the end portraying the ultimate fate of the major characters. It shows Templeton at Columbia University with the senior editors of the fictional Sun accepting the Pulitzer Prize, with no mention being made as to the aftermath of Templeton's career. ↑ "(Baltimore) The Sun". Thomson Reuters. Retrieved May 28, 2008. ↑ "TRIBUNE CO. ANNOUNCES PLANS TO LAYOFF [sic] 27 PERCENT OF THE BALTIMORE SUN'S NEWSROOM STAFF, INCLUDING FOUR COLUMNISTS". Poynter. May 30, 2009. Archived from the original on May 14, 2009. Retrieved May 30, 2009. ↑ Shin, Annys (October 18, 2007). "Examiner Plans Baltimore Edition". The Washington Post. Retrieved June 25, 2007. ↑ Charles Apple (August 24, 2008). "Live pages from the Baltimore Sun's redesign". visualeditors.com. Retrieved October 22, 2008. ↑ Romenesko, Jim. "Updated: Baltimore Sun to put up paywall next month | Poynter". Poynter. Retrieved 2014-02-20. ↑ "Baltimore Sun Media Group to buy City Paper". The Baltimore Sun. Retrieved February 20, 2014. ↑ "Baltimore Sun – The No. 31 Newspaper in the USA". Mondo Code. Retrieved May 28, 2008. ↑ "About The Baltimore Sun". The Baltimore Sun. Retrieved May 28, 2008. ↑ "Sun Columnist Dismissed; Attribution Issues Cited". The Washington Post. January 5, 2006. Retrieved September 14, 2010. ↑ "On Background". Baltimore City Paper. January 18, 2006. Retrieved September 14, 2010. ↑ "Ex-NSA worker from Md. charged in classified leak case". The Baltimore Sun. April 15, 2010. Retrieved September 14, 2010. ↑ Steiner, Linda; Guo, Jing; McCaffrey, Raymond; Hills, Paul (August 2012). "The Wire and repair of the journalistic paradigm". Journalism. Sage. 14 (6): 703–720. doi:10.1177/1464884912455901. "Control of Baltimore Sun. Charles H. Grasty Becomes Executive Head of the Paper". NY Times. January 27, 1910.